Charity regatta returns to San Diego, April 7. SAN DIEGO — Classic vessels such as the Bill of Rights are invited to participate in this year’s running of America’s Schooner Cup Regatta, which takes place April 7 on San Diego Bay. Competition begins at 11:30 a.m., with spectators taking in the regatta at various onshore locations. The organizing committee expects as many as 12 schooners to participate in the 30th annual America’s Schooner Cup Charity Regatta, such as the 30-foot Maid of Kent, 139-foot replica of America, 142-foot Californian and the 136-foot Bill of Rights. Californian is California’s official tall ship, while the original America claimed her ticket to fame after a regatta victory over the British in 1851 helped rename the international sailing competition as America’s Cup. The regatta generally draws schooners from up and down the West Coast, in all sizes and vintages. The course is designed to provide the public with ample opportunities to take in the action. This year’s regatta, as in years past, will benefit the Navy-Marine Corps Relief Society (its members, eligible family members and survivors). Silver Gate Yacht Club Foundation is the official host of the regatta. Racing will start and finish at an offshore location near the public beach across the road from Silver Gate Yacht Club (2901 Shelter Island Drive, San Diego). Some of the schooners will take on paying passengers; contact Jerry Newton at 619-222-1281 for more information. Additional information is available at AmericasSchoonerCup.com. Rose of Sharon won last year’s Schooner Cup, edging out Curlew and Dauntless at the finish line. 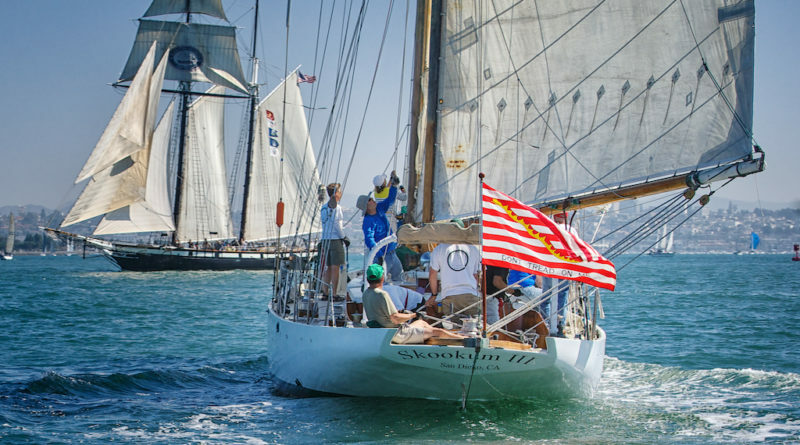 Tickets range from $48 to $70; visit sdmaritime.org and search for Schooner Cup to find out more about the regatta and boarding Californian. The regatta is sponsored by Star Clippers. Racing ends at about 3 p.m. The first-ever Schooner Cup was held in 1988.